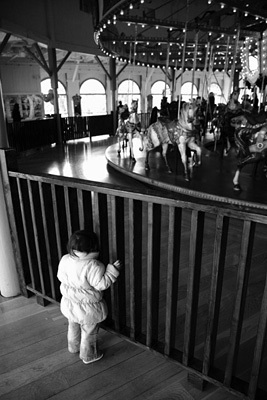 Grab Shot 92 - "Waiting to Ride"
"The little girl is waiting for her mom to get change so they can ride the carousel," says Victor Cenac-Mehedinti. "While she waits, she looks through the bars with anticipation!" Victor captured this image at the Santa Monica Pier with a Canon 5D, Canon EF 24-105 USM L. The ISO was set to 400, shutter speed was 1/100, and aperture was f-4.